Friday’s rally continued into Monday, as the Turkish lira stabilised, and markets were hopeful about the continuing China trade talks. All equity indices were up, with export-heavy DAX up 1%. Only NKY bucked the trend, fading slightly in the Asian cash session and failing to recover during the (futures) day, partly because of a stronger yen. 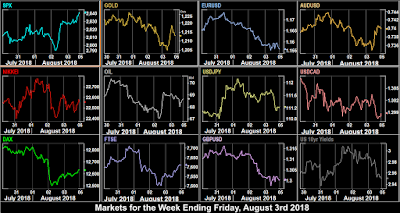 The dollar continued downwards, with DXY giving up 0.42% on the day, and losing ground against all currencies, Gold and Oil, and US 10-year bond yields were down to in line, to their lowest level (2.82%) for a month, as the market looked forward to Wednesdays FOMC minutes and Jackson Hole, and bearing in mind President Trump saying he was “not thrilled” about interest rate rises. Lots of volatility today as SPX first shot up to touch an intraday all-time high of 2873.23, beating the January record. However, it then sharply reversed after news broke of Trump lawyer Michael Cohen implicating the president in the hush money payoffs in the run up to the election. The key point is not the payments, it is the fact they may be regarded as undeclared and therefore illegal election expenses. 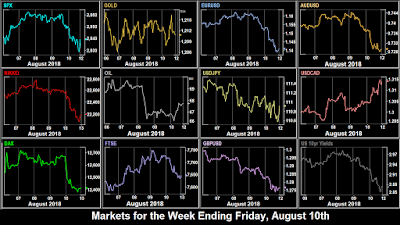 NKY, DAX and FTSE finished up in their cash sessions, but futures were then dragged back down by the late US selloff, and a strong showing from the European currencies. A clear case of technical resistance to the high. Subsidiary indices RUT and DJT also hit record intraday and closing highs. The dollar retreated further, with DXY giving up 0.55%, its worst day for a month, as speculation on whether the FOMC minutes or Jackson Hole will reveal any reaction from the Fed to the Trump statements. The gains were in EUR and GBP. The picture was not even though, JPY was up, and CAD managed to keep pace with USD (ie USDCAD was flat). Gold was up in line with the weaker dollar, although Oil fell, despite an early rally. NZD was up against the ailing dollar despite the GDT miss at 14:24. It was however down against AUD. Yields recovered 2bp from their sharp fall on Monday, despite the dollar fade, but in line with early SPX rally. Few people remember the Jul 16-Oct 11 1990 20% ‘crash’ because, unlike Oct 19, 1987, it wasn’t instantaneous. At only 62 business days it was however quite fast, but from then on the market never lost 20% for 3,453 days, until its all-time high on Mar 24, 2000 (at which point it started a two and a half year decline losing half its value.) 20% is the benchmark for bear territory, and conversely a market which never dips this much is defined as a continuous bull market. This means today was an important day statistically, as the record 3,453 period from the low of Mar 9, 2009 was equalled. SPX was up, although it didn’t touch the previous day’s intraday ATH. So were other indices. The dollar fell for the sixth day in a row, and was little affected by the Fed minutes. Even CAD outperformed despite the Retail Sales miss at 12:30. However, the movement was not great (DXY -0.13%), and Gold and GBP were virtually flat. Oil was comfortably up after the EIA Stock beat at 14:30, and yields were down a further 2bp. Today the US/China two-way tariffs came in to force. AUD fell sharply during the Asian session due to political uncertainty over the political leadership. But in any event, there was a sharp turnaround in USD, with DXY up 0.51%, probably as traders searched for evidence of Trump pressure in the Fed minutes and failed to find it. Notably JPY fell more than the other currencies, although all were down, as was Gold. Yields were flat on the day as was Oil. Indices drifted slightly down on concerns about Cohen, and of course the lack of dovishness in the Fed minutes. The misses on forward looking housing and PMI data didn’t help. BABA beat estimates, but the stock still faded after an early rally. The earnings were foreshadowed by AABA reporting earlier. (AABA is Yahoo Japan plus Yahoo’s holdings in BABA. The other Yahoo business was sold to Verizon in 2006). Jay Powells speech on Friday at Jackson Hole was just what the markets wanted and just what the dollar didn’t. He defended the gradual interest rate rises, but did not see any risk of inflation overheating the economy. Crucially, it’s what he didn’t mention (the trade wars and presidential pressure) that marked the speech as dovish. SPX and IXIC (the Nasdaq Composite, not NDX) made new closing highs, and all markets were up. DXY fell 0.49% in short order, and all currencies rose. Gold was up $20, its best day since May 2017, although this is also because it was so severely oversold last week. The yellow metal is still down 1.55% month to date. Oil and yields were flat on the day, although yields had risen before Powell spoke. USD had its worst week since February, after Trump’s remarks about interest rates. However, the risk-on markets meant JPY fell further, and the biggest forex mover for the week was EURJPY. The risk barometer pair was up 2.52% as equities hit all-time highs again. Reversals came as DAX was the best performing index and Oil the best performing commodity after both being the worst last week. The crypto separation between Bitcoin and Ethereum continued, as ETHBTC fell by over 10% for the second week running. From this week we have added the FAANG stocks to the price movement list. Four of them were nearly flat, but NFLX hugely outperformed after an upgrade from advisor Sun Trust. The main news today is the German sentiment indicators, which analysts expected to be broadly in line with last month. Without much other news, the continuing Trump/Cohen circus is expected to dominate news, along with a fuller assessment of Jackson Hole. The UK is closed for the late summer bank holiday. Again not much to report in advance. The S&P/Case Shiller Home Price indices estimate the same annual increase as last month (6.5%), whereas the government monthly figures last month missed (0.2% vs 0.3% est). ECB Praet speaks in Germany at 11:00. More PCE figures from the US today, although the effect is clearly muted with the QoQ release the day before. Nevertheless our comments about heightened Fed sensitivity (and therefore the dollar) apply. Two other inflation prints today, the real thing (CPI) from Germany and Japan (Tokyo only). Note as always that the German figure is important, the only reason it does not tend to move markets is that it usually comes in in line with estimates, ie it does not beat or miss. A NAFTA agreement in principle is expected today from Mexico. (Canada’s deadline is later). ECB de Guindos speaks at 17:00. Although we have German Retail Sales, this figure is blunted by the CPI release the day before. Similarly, the Eurozone CPI moves markets less than you would think, mainly because the constituent countries have already reported, and the estimate is usually accurate. The end of the month may produce some rebalancing volatility. Turkey continued to dominate market sentiment, as TRY gapped up 8% over the weekend, and breached 7.00 for the first time. ZAR briefly fell 10% during the Asian session, but started to recover during the day. Although SPX attempted a rally in early US trade, all indices ended the day negative. Although DXY briefly touched a new 2018 high, the dollar was flat overall (+0.07%), with a slightly weakened EUR being balanced by a slightly stronger GBP, CAD and JPY. Gold fell substantially, dropping $17 (1.4%) to its lowest level since Jan 17. Oil fell sharply (2.5%) in the early US session on demand fears, but fully recovered three hours later. Yields recovered slightly after Friday’s sharp drop. As TRY recovered 8% after its drastic falls, turnaround Tuesday again for indices which all rose, except FTSE which fell slightly as mining stocks sold off after the miss in Chinese Industrial Production at 02:00. The dollar had a much firmer day with DXY up 0.34%. All currencies faded against the greenback except CAD which put on 0.57%, its best day this month. Some of this can be explained by the risk-on sentiment, and an early rally in Oil. The risk on was not enough to help AUD, after Tuesday’s fall in Gold although the metal was actually flat today. Oil was also flat, and yields were up 2bp in line with the stronger dollar. The previous day’s rally was short-lived. Despite TRL recovering (we can hardly say rallying) another 7%, equities fell hard on Wednesday, the biggest daily drop since June, with SPX down over 0.8%. Traders started to think about contagion from Turkey (ie banks and sovereigns exposed to Turkish dollar debt), and of course the ongoing trade war issues, but the trigger may have been Tencent, the Chinese internet giant (part of BAT, the other two are Baidu [BIDU] and Alibaba [BABA]) who reported their first net profit decline in over a decade. BAT is the Chinese equivalent of FANG, and we know from previous weeks that despite beating estimates, any signs of slowdown in this sector have been punished harshly by the market. Shares in TCEHY opened 9.5% lower and were 6.7% down at the close. BABA had its worst day for over a year. DXY had a similar day to Monday (+0.06%), more or less flat. Unusually, it was flat against EUR and GBP declined slightly. A larger move in JPY in line (up 0.39%) with the equity fade was matched by a 0.64% drop in CAD following the EIA Oil Stock miss at 14:30 and consequent 2.5% in Oil itself, a move we pointed out last week. CAD does tend to do this. 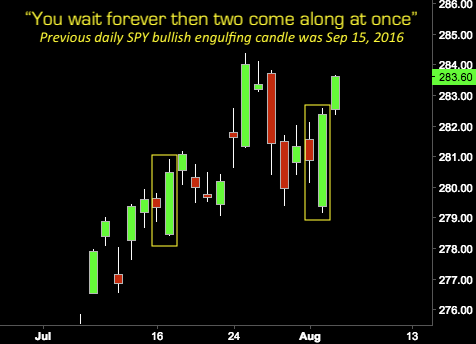 If the price moves sharply, the next trigger for reversal tends to reverse 100% of the earlier move. Yields fell as risk-off money rotated into bonds. Gold continued to tumble, dropping another $20 to $1,173, a new low. Overnight it was announced that the US and China were resuming trade talks. Although there were no firm details, this was enough to recover all yesterday’s losses and more. DJIA was up over 400 points at one point, and closed 323 up (1.28%) its best day since May 4, helped by 2.8% on BA (nearly 10% by weight), and WMT, up 9.3% beating estimates with its highest earnings for a decade. USD had a less eventful day. The trend was down, but DXY was only off 0.1% with very small moves up in EUR and GBP (and AUD which is not part of DXY). CAD and JPY retreated, but by less than 0.15%. Gold had its first up day of the week, and yields were down, both in line with the weaker dollar, as was the slight advance in Oil. Monthly Opex day, and the US equity markets started with a dip but then rallied on Friday, although the effect was more muted in NDX, with only AAPL holding it up. This has been a trend all week. NDX closed down 0.57% for the week, but AAPL (12.32% of NDX) advanced 4.76%, ie without AAPL the tech index would have been down over 5%. Contrast this with a 1.35% gain for the week in DJIA. The effect of the thawing in the trade war is clear. European markets were flat, possibly as EUR and GBP advanced. DXY had its worst day for nearly a month, fading 0.49%, with all currencies advancing, particularly CAD after a strong beat on inflation (3.0% vs 2.5%) at 12:30. We did not know the outcome, but given the beat, the move was predictable (see Wednesday). CAD put on 0.72% to almost exactly recover Wednesday’s loss. As yesterday, Gold and Oil were up and yields were down in line with the further dollar decline. DXY hit a new 13-month high on Wednesday but pulled back to post its first negative week for a month. Only GBP fell against the dollar, and the strongest currency was NZD, after three bad weeks. Therefore shorting GBPNZD for 0.84% would have been the best forex trade. For the third week in a row, DAX was the weakest index. The surprise move was Gold, which had its worst week of 2018, at one point down over 4%. Nevertheless, as is so often the case, shorting Oil was the overall best trade of the week. The weakness of ETH against BTC continued for a second week. It was the first week since March when the two leading cryptos moved in opposite directions, and ETHBTC made another 2018 low. This week is central bank dominated, and we start with three central banker speeches. Also Greece is due to exit its third bailout programme, after which it will be subject to ‘enhanced surveillance’ by the ECB. A week long session of public hearings on open on the USTR China tariffs, so expect news today or at any time in the week. Like last Monday, there are no economic releases of note. The RBA Minutes come shortly after Governor Lowe’s speech. It is difficult to know whether last week’s 19-month low is a bottom, but any hawkish statements could move the currency upwards, and avoid a further decline towards the long-term support level of 0.7150. Staying in that part of the world, the GDT milk index often provides volatility to NZD, which is languishing at a two-and-a-half year low. There is no important US news today. There is no rate decision today, but the FOMC minutes are important. These are from their meeting on Jul 31/Aug 1, the first since President Trump commented about preferring lower interest rates, and a lower dollar. Since those comments on Jul 19th, DXY has risen 1%, although some of this is because of European problems, ie USDJPY has fallen 2.1% in this period. The CME Fedwatch tool still predicts a 93.6% chance of a hike next month (Sep 26). Traders will be watching carefully for any language (or the dot-plot) indicating dovishness. A busier calendar today with various PMIs and Japanese inflation. Although the Jackson Hole meeting starts today, the business proper will be on Friday and Saturday. This means the ECB Minutes are the main event of the day. The earnings season is now drawing to a close, but BABA, the last of the ‘BAT’ stocks (the Chinese equivalent of FANG) reports before the bell. We expect the pattern to be similar to the other stocks in this sector, a modest rise if all metrics are positive, a sharp fall if any are not. Also today, additional 25% tariffs on $16Bn of Chinese imports commences, as do the Chinese retaliatory measures. The annual Kansas Fed conference at Jackson Hole, Wyoming gets underway today. The calendar is not published until Thursday evening, so we are not able to pinpoint specific speech times. We only currently have BoC Governor Poloz speaking at 16:25 in a panel discussion on Saturday. We do however have a topic list which covers increased market concentrations in many industries, the price effect of online retailing, and the problem of low wage growth. With no other important news on the calendar, the conference will probably dominate market movements. Markets rallied on Friday and this continued today. There were no economic releases, but President Trump said he was winning the trade war, and the market shrugged off Chinese threats to impose retaliatory tariffs. All indices advanced. DAX was not as strong as the others. The Italian government bought back some debt, pushing their (and US) bond yields down, which was good for Europe. However TRY fell 4% to a new all-time low, which was not. We mentioned in previous weeks how Germany and Turkey’s economies are linked. 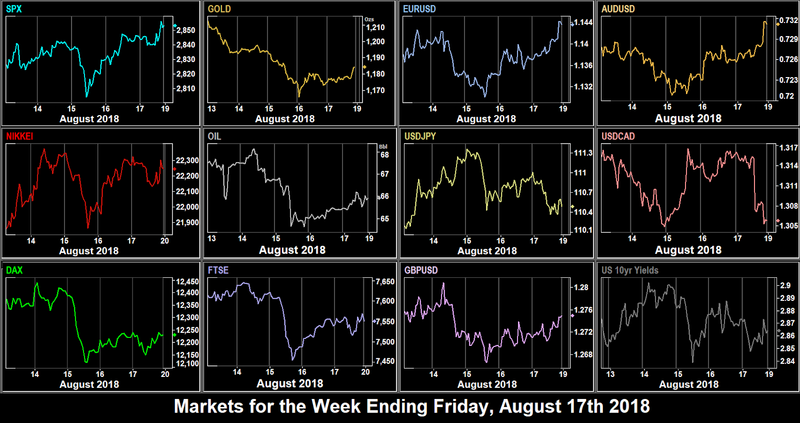 The forex effect, surprisingly for EUR was flat, as it was across the board, except for GBP which continued last week’s decline, producing a small uptick in DXY overall. Gold was down $5 on the day. The RBA rate hold and remarks during Asian session gave AUD a lift, and equities were up as well. However, the indices flattened out in the European and US session, as China threatened $60Bn of retaliatory sanctions, but nevertheless closed the day up, helped by more strong earnings. 413 SPX constituents have now reported for Q2 and 79% have beaten on earnings. The UK FTSE was particularly strong on weak sterling. The big news in equities was a tweet by Elon Musk saying he would take TSLA private at $420. The stock immediately leapt by 10%.to close at $379.50. SNAP beat EPS and revenue estimates, but reported lower user numbers, a similar story to Facebook, Twitter and Netflix. The stock initially shot up 11%, then gave it all up, to open 2.2% down the next day. USD had a slightly down day, with DXY giving up 0.16%. 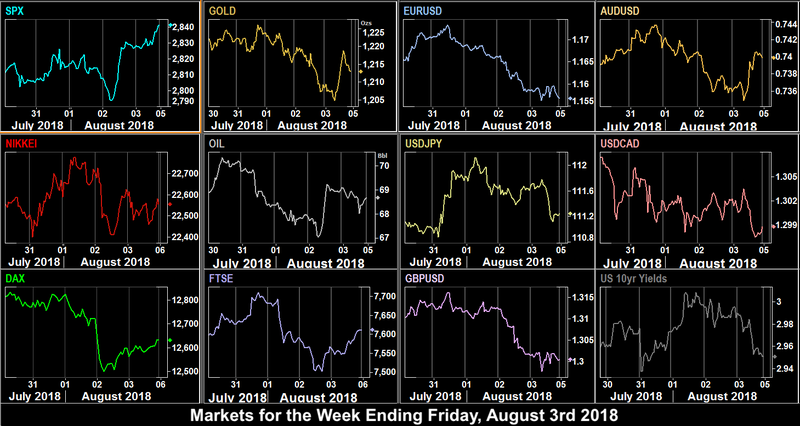 The picture was mixed, with EUR and AUD up, but GBP (on Brexit ‘no deal’ fears), CAD and JPY slightly down. NZD was flat despite after a flat (0.0%) GDT milk auction. Gold was up in line with the weaker dollar. Oil was also flat on the day. We have said before how the equity price pattern at the moment is an uptrend on no news, which is then knocked back when a trade war news item appears. So it was today. US trade officials confirmed tariffs on a $16Bn tranche of Chinese imports from August 23. Chinese markets fell in Asia, with the CSI300 near a two-year low. The trend continued into European and US markets. The only exception was FTSE, as GBP gave up further ground against the dollar, the only currency to do so. Mainstream media were still talking about the SPX being near all-time highs, some would say a sure sign it will fall! Oil had started to fall heavily from about 10:00, on China trade concerns (we have mentioned in the past how trade and Oil are linked, for obvious reasons). A miss on the EIA print at 15:30 exacerbated the problem, and the black stuff ended the day 3.5% down, its worst day for three weeks. DXY was down again, but GBP losses trimmed the basket’s decline to 0.1%. The other currencies (and Gold) were slightly up on the day. The notable move of the day was RUB, which fell 3.2% after the US announced further sanctions on Russia following the Skripal poisoning case. RUB was also hurt by the fall in Oil. (BNO was down 3%). The RBNZ held rates, with a dovish outlook and NZD started to fall (see tomorrow). We will cover forex first today. In addition to all their other problems, Turkey has been holding a US citizen in prison following the failed coup attempt in 2016. Talks to release him failed today, and in anticipation of punitive measures, TRY fell 5.12% today, its worst day since October 2008. RUB continued to fall from the previous day, down 1.43%. We also had the NZD collapse, down 1.96% on the day. As a consequence of the Turkey and Russia routs, EM currencies MXN and ZAR fell 1.22% and 2.23% respectively, purely on sentiment, as Mexico and South Africa are not known for their Turkish links [and they didn’t react to RUB on Wednesday]. The Eurozone is strongly linked with Turkey, and EUR fell 0.72% (and PLN 1.04%). AUD fell in line with NZD, and even CAD, JPY and Gold were slightly down. Notably CNY had a flat day (as it did on Wednesday). DXY was therefore up 0.54%. Oil was only slightly down after Wednesday’s drop. Unsurprisingly, with all this trouble, US stocks fell, although only slightly, and the ‘trade war insensitive’ NDX was 0.2% up. DAX was up, solely on the strength of EUR (The dollar denominated EWG ETF was 0.58% down), and FTSE advanced for the same reason. NKY was flat. Notably, with the huge drop in TRY, the Istanbul BIST100 only managed a 0.2% gain. US yields were down, as traders preferred bonds to Gold/JPY as their risk-off asset class of choice. The response of the US to the failed Pastor Brunson talks was swift and savage, doubling tariffs on Turkish steel and aluminum. Turkey is the eighth largest steel exporter in the world, 25% of that of China. Who knew? The US is, unsurprisingly their largest market. Their second largest market is Israel, a stark reminder of the difference between politics and trade! TRY fell 15.63% on the day, the lira’s worst day ever, and the largest move of any major currency since GBP at Brexit, and before that the Swiss franc peg. A slight recovery was quashed when President Erdogan made a defiant speech. EUR fell 1%, and RUB, ZAR, MXN and PLN performed even worse than on Thursday, with CZK joining the 1%+ club. DXY added 0.65%. A clear risk-off situation meant Gold and JPY were up. Oil staged a small recovery, adding 1.5% on the day. US yields fell 6bp on further movement into safe US bonds. AUD was briefly up (30 pips) on the RBA minutes at 01:30, but then fell in line with the general move. A second and more serious day in this crisis had a larger effect of stocks. All markets were down, but the strongest effect was, unsurprisingly seen in DAX, down 2%. The Italian MIB was down 2.5%, and the BIST 100 was down 2.3% (so nearly 18% in dollar terms). The US inflation print at 12:30, which was a beat at 2.4%, and an eight-year high, was lost in the turmoil, as was the Canadian stellar jobs beat (54.1k v 17k est) at the same time. DXY added 1.12% this week to hit a 13-month high, as Trump appears to be ‘winning’ the trade war, although JPY shows that it is more a case of US losses being less than foreign countries. Selling anything into JPY would have been a winner, the best major being NZD. (Selling TRYJPY would have yielded 21%!). The Turkish contagion affected DAX most, as we have explained above, making it the best index short of the week. The crypto collapse continued into a second week, with ETH once again suffering worse than BTC, and unlike it’s bigger cousin, making a 2018, and post-big crash low. 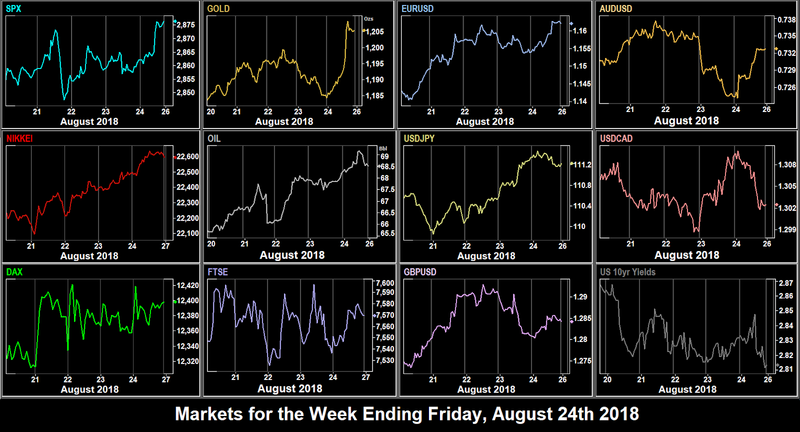 Forex showed a little bit more activity than last week, with a stronger USD upside (DXY added 0.52%). CAD gained for the third week in a row, and was the strongest performer. Selling GBPCAD would have netted 1.25%. The biggest index mover was DAX, which erased most of last week’s gains. After two weeks of rallying, cryptos fell back, once again ETH being weaker than BTC, making a 2018 low against USD and against BTC. Another quiet start to the week. All eyes will be on the EM currencies, and also any further progress on NAFTA. There are no important news releases, but Italy’s inflation figure is released at 08:00. A double whammy of GDP and CPI from Germany opens the day, swiftly followed by the first of three data prints from the UK this week, the average earnings, together with the less important unemployment and claimant count. The UK does not release new jobs filled figures. The German business sentiment figures missed badly last month. Since then EC President Juncker has met with Trump and the Italian situation has eased. An improved figure is expected, although recent Turkey issue may spoil that. The outcome of the NAFTA auto origin deal with Mexico is expected. This is the biggest day of the week for economic news. After the BoE rate hike, and guidance that the next one is a long time away, UK inflation would have to deviate substantially. The core annual figure is expected to rise to 2.2%. This figure will probably be taken by traders along with the previous days earnings figure to determine whether sterling falls any further. US Retail Sales are less important that usual, given that CPI (for which they are a proxy) was reported last week. Watch out for the EIA Stock print, it has been moving Oil noticeably in the last few weeks, in the absence of OPEC noises. Italian Markets are closed for the Assumption Day holiday. Although there is a raft of minor US data, the main calendar event today is the Australian jobs report. The estimate is more modest (and therefore easier to beat) than last month’s blowout figure. It remains to be seen whether this will help the beleaguered AUD which fell sharply last week. RBA Governor Lowe appears before the Australian House for their version of Humphrey-Hawkins. The third UK print, Retail Sales should have limited impact for the same reason as the US release on Wednesday. There is a rate decision in Norway. Two more inflation releases today, the Canadian being the more likely to cause volatility. Eurozone figures rarely move the Euro, mainly because the figure tends to follow the individual country releases. The monthly Michigan sentiment index last month showed a significant increase in concern about tariffs. This part of the survey will therefore be of heightened interest this month. Monthly options expire today, which may provide additional volatility. The markets were still spooked on Monday by the momentous FB and TWTR crashes last week, and equity indices were generally down. Only FTSE, an oil proxy, posted a green candle after a 1.55% lift in the price of Oil. 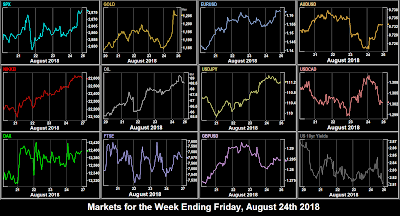 The dollar had a tough day, with DXY down 0.33% and all currencies gaining, except a flat JPY, which was unusual at the day saw JGBs (10-year Japanese Gilts) spike to an 18-month high of 0.113%. Gold was up in line with the weaker dollar, but US 10-year bond yields were actually up 1.6bp, and the yield curve (10-year yield minus 2-year yield) widened slightly. The final day of the month was a Turnaround Tuesday for equities and USD, led initially by the BoJ action to strengthen its QE framework by making its bond buying programme more flexible. The effects were seen in an unusually volatile Asian market which saw the JGB bond yield drop by over half from 0.113% to 0.048%. All indices were up on the day. NDX outperformed after falling nearly 4% from last week’s all-time high. The first day of the new month saw a pullback in US and European equities, starting in Asia, and continuing all day, on news that the US could more than double the planned tariffs on $200Bn of Chinese imports. Even the further advance of AAPL to close 5.9% up (and AAPL is 4.24% of SPX, 5.55% of DJIA and 11.99% of NDX) could not prevent indices from posting red candles. Even NDX itself was only flat. Oil fell again, in line, helped by the EIA Stock miss at 14:30. Oil prices are strongly linked to international trade, for obvious reasons. FTSE suffered the worst, because it is a oil proxy, and also because GBP bucked the currency trend and rose slightly in anticipation of Thursday’s BoE rate decision. NKY was slightly up, reacting to the previous day’s JPY move. Otherwise USD was generally up again. A quick rule of thumb to see if it is USD or EUR that is the focus of traders is to glance at the EUR and AUD (an unrelated currency) charts. It is clear to see this week that USD has been the driver, the two charts are similar until mid-Thursday. Both were down, along with Gold. However, today, CAD joined JPY and GBP in beating USD, but the moves were small. Yields were up 3.9bp, followed the rising DXY, crossing the 3% line and making a three-month high into the Fed rate hold. There were however no notable moves after the release. Readers will remember that last Wednesday July 25 was a day of two halves, and so it was again today. 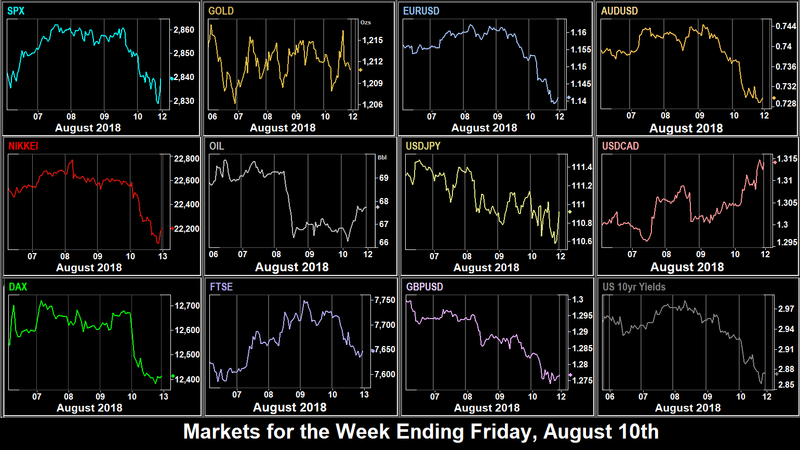 Asian and European markets (and US futures) fell in pre-US trading on the continuing trade war worries. Markets, as you might expect took hits roughly scaled to their exposure, with China coming off worst, Japan next, and then DAX and STOXX. The latter did not fare any worse than DAX, Germany may be the strongest EU economy, but it is the biggest exporter, and therefore most exposed. However, the mood changed completely in the US session. SPX came off a futures low of 2789, a technical support area from July, and rose solidly all day adding 1.4% from the low. The cash-only SPY posted a bullish engulfing near-marubozu candle, the second in two weeks, a pattern not seen for nearly two years. The only news to support this was the moderate Jobless Claims beat at 12:30. The other indices recovered, but not sufficiently to go green. DXY had its best day of the week up 0.57%. The biggest loser was GBP after the long-awaited rate hike to 0.75% which was accompanied by BoE Governor Carney, who said there would be no more rate hikes this year, and suggested a figure of 1.21% (only 0.46% more), later revised to 1.5% by 2021 (three years away). You can’t get much more dovish than that, and cable immediately fell 0.5%, and after a slight rebound finished the day 0.8% down. However, the was against a background of a further USD advance across the board. Gold was down in line. Oil sharply rebounded (up 2.1%) recovering Wednesday’s losses. Yield were down 2bp, back under 3%. We had a US all-time record with the Facebook crash last week, and today there was another. AAPL continued its advance past $207.04, the point at which its market cap exceeded one trillion dollars, the first US company in history to do so. Exuberant journalists had little to say about PetroChina, who hit the magic figure on the day of their Shanghai IPO on Nov 5, 2007. The company’s market cap a year later was less than 26% of that figure, the largest single company destruction of shareholder wealth in history. Remember though, this AAPL price is far from a bubbler. AAPL trades at a PE of 18.8 compared to an SPX average PE of 23.7. On a day when China announces retaliatory tariffs on $60Bn of US good, the Non-farm payrolls misses by 20% (a surprise after the ADP and Jobless Claims beats), and rising markets most of the week, you would expect a profit-taking pullback on Friday. But that’s not what happened. After gently rising in early trade, markets rallied after the NFP miss (157k vs 195k estimate) with SPX adding 0.38%. We mentioned last week how the AHE figure is as, if not more, important than the jobs number, and this print (2.7%) was in line with estimates. The currently topical Trade Balance release also beat. Only NKY was down on the day, probably due to the market hours. The currency position was mixed. A flat DXY masked a picture we have seen before. The underlying trend was a weaker dollar (JPY, CAD, AUD and Gold showed near-identical price action during the day), but GBP (following the BoE remarks) and EUR on another spike in Italian yields (and TRY concerns) followed an initial dip, but failed to rise after the NFP release, and ended up down for the day. Yields pulled back again in line with the dollar, and Oil faded slightly. Forex showed a little bit more activity than last week, with a stronger USD upside (DXY added 0.52%). CAD gained for the third week in a row, and was the strongest performer. Selling GBPCAD would have netted 1.25%. The biggest index mover was DAX, which erased most of last week’s gains. After two weeks of rallying, cryptos fell back, once again ETH being weaker than BTC. 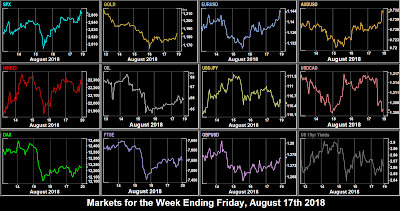 As we move into Northern Hemisphere vacation time, Monday is complete absent of US news releases, and is expected to be a quiet day, playing out the results of last week’s FOMC and NFP. There is a GBP 30-year bond auction at some point in the European morning. Canada is closed for the August Civic holiday. With Australian inflation below the RBA 2-3% target, the RBA rate decision, or rather the statement accompanying it is unlikely to surprise, and continued ranging of AUD is expected. Volatile social media stock SNAP, still a loss maker (EPS est -0.31) reports after the bell, as does DIS. The earnings season is now drawing to a close with most majors having reported. Again, there is very little in the way of significant releases from Europe and North America. As with Australia, no surprises are expected from the RBNZ and the currency is expected to carry on ranging. Similarly RBA Governor Orr, speaking so soon after the Australian rate decision is unlikely to move the currency. Other than an unimportant Mortgage Applications print, we have another day of no US releases. Fed Barkin (hawkish, voter) speaks at 12:45. Chinese inflation at 01:30 may set the tone for Asia. This is followed by the US PPI which is a forward indicator of inflation, and at the end of the day we have Japanese GDP. Today the USTR and Japan’s Economy Minister Motegi hold their first bilateral trade talks in Washington. Any positive news to come out of this (remember the EU in July) should help NKY and USDJPY. Singapore and South Africa are closed for holidays. Friday is the big day of the week for economic releases. A third airing of RBA views in the week is unlikely to matter, but as Europe opens, we should see some action. UK GDP at 08:30 is the first release since the rate hike last week, which did not lift GBP. A positive print here may do so, as cable is currently sitting at a support level. Even more important is the US inflation figure, one of the dual mandates of the Fed. Concurrent with this is the Canadian jobs report, one week later than the US this month. CAD has recently outperformed other currencies, and volatility is the norm on this release.